Does this table setting look familiar? 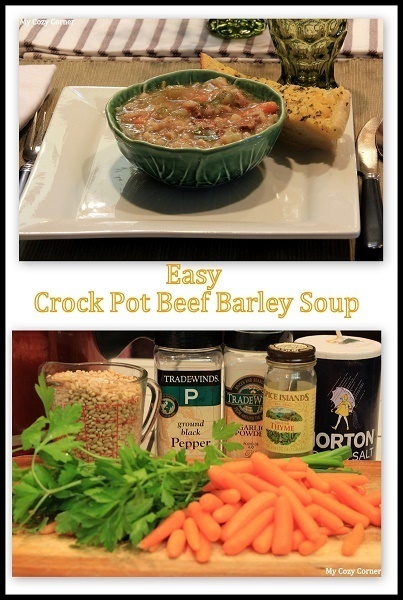 posting my recipe for Savory Crock Pot Beef Barley Soup. The ingredients on the breadboard are so colorful and healthy. freshly picked from the herb garden. This recipe yields 8 to10 servings. playoffs without having to get up and cook dinner. I also froze a quart of soup for our dinner on another rainy Winter Eve. Easy recipe to cook in a Crock Pot. In the skillet over medium heat, saute the beef in the oil for 5 minutes, or until browned. Stir in the salt, pepper and garlic powder and place seasoned meat in the crock pot. Add the broth, water, celery, carrots, green onions, parsley, and barley. Cover and cook on low setting for 6 to 8 hours, or until the vegetables and barley are tender. Add the thyme just before serving. 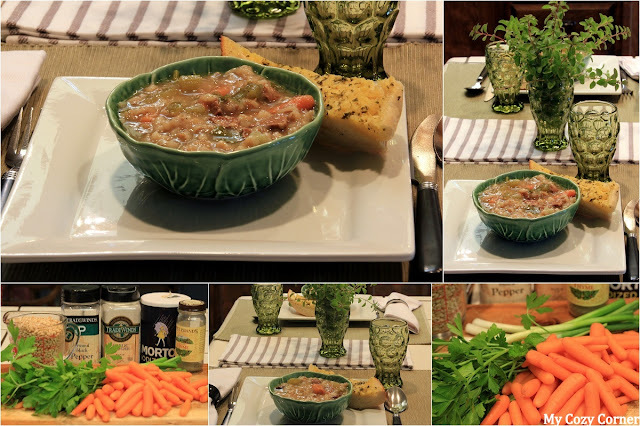 This soup looks wonderful and I really could use a bowl today. It has been cold and rainny for the last week. So this sounds like it would be good. Thanks so much for the recipe. Have a great week. Looks delicious, thanks for sharing! Love those beautiful green glasses!! Bowls are adorable too! Have a great week! I love barley in a soup. That looks delicious! Thanks for joining Home Sweet Home!